Tarh Welfare Society (TWS) resolved to set up Tarh Old Age Rehabilitation Centre (TOARC) at an identified place in this village to mark its 13th foundation day celebration here today. 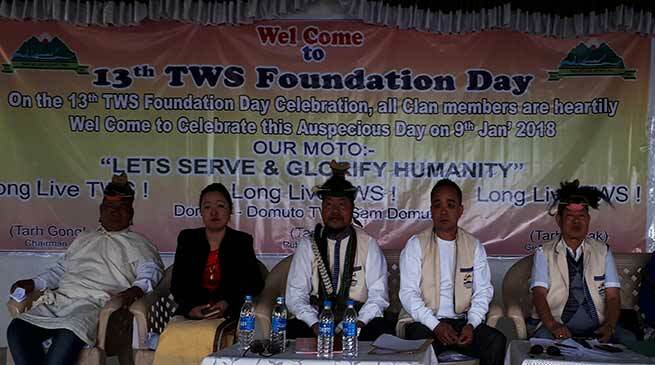 The TWS would aggressively carry on its outreach programmes as its future vision to make the clan vibrant, Tarak said, adding its various achievements and activities during last two years included solving decade-old problems, health & education awareness camps in various districts. All should stand united for the TWS to march ahead, said its chairman Tarh Gongkap, adding the youth should give top priority to education and aim at cracking UPSC examinations to become IAS, IPS officers. Pointing out that women have a vital role to bring positive changes in society for a better tomorrow, Yangte ZPM Tarh Monika called upon them to rise above petty differences to contribute to the society. She, as TWS women wing chairperson, announced to develop dress code for Tarh cultural team for any event, including state and national levels. About 25,000 Tarhs live in Capital, Papum Prare, Lower Subansiri, Upper Subansisir, Kurung Kumey, Kra-Daddi, East Kameng. Orphans who are deserving ones should be identified by a committee to help them pursue education as a positive step, a member suggested. The day-long event, attended, among others, by Vice chairman Tarh Miri, IMC deputy chief councillor Tarh Nachung, Naharlagun ZPM Techi Tulu, Poma HGB Tarh Sangkio, senior officers, technocrats, bureaucrats, was punctuated by cultural programmes, particularly soul stirring songs including AIR artist & Arunachal Idol-2018 Tarh Chuny) and Kurung Kumey Idol Tarh Tadey, both 4th runner-ups.